Update to original post: The Granary Burying Groundin Massachusetts is the city of Boston's third-oldest cemetery. Located on Tremont Street, it is the final resting place for many notable Revolutionary War-era patriots, including three signers of the Declaration of Independence, Paul Revere and the five victims of the Boston Massacre. The cemetery is adjacent to Park Street Church and immediately across from Suffolk University Law School. A very fine shot and a perfect choice for monochrome. Old tombs, stories. Have a wonderful Memorial Day. Beautiful perspective and so appropriate for this holiday. I'll be talking to my dad later today to thank him again for his service during WWII. Moving image, so many headstones. Know this place well. Have shots lots of film and digitals here. Which cemetary is this? A very good image for Memorial Day. Lest we forget. 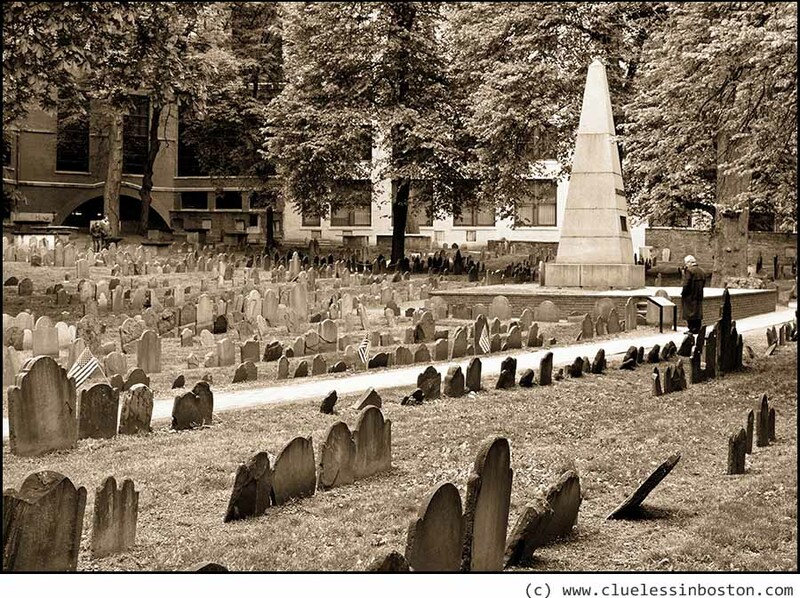 Janet - this is the Old Granary Burial Ground on Tremont Street. Thank you. I should have recognized it but it's a long time since I lived in Belmont and went in to Boston regularly, My brother used to work in the Home Savings Bank and he attended Suffolk University when he got out of the Navy at the end of World War II.